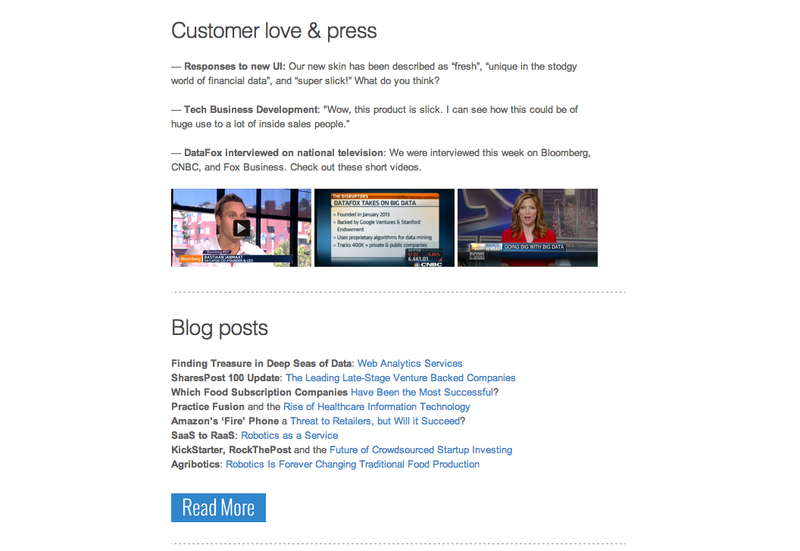 How our monthly Advisor Update email is getting us recruits, customers, and future investors. We initially shared this post on Medium on July 16, 2014. 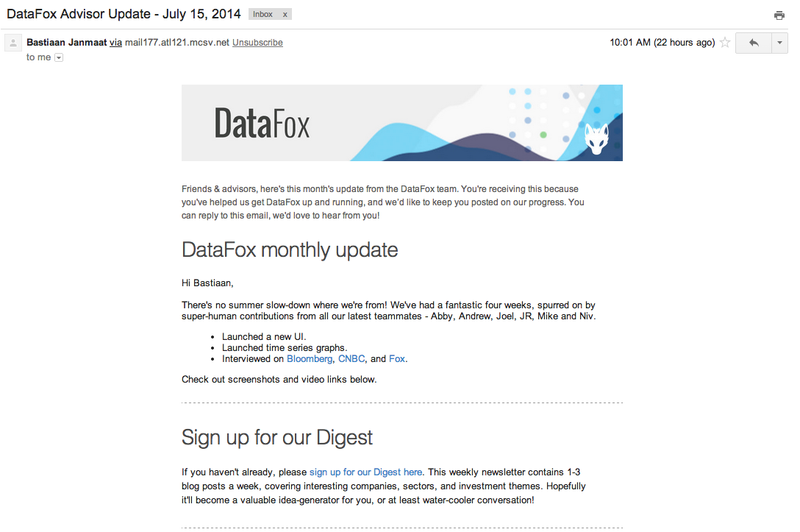 One of the highest return-on-time things we do at DataFox is put together a monthly “Advisor Update” email. It’s sent to about 150 people and has been the catalyst for some of our best hires, customers, partnerships, and other opportunities. It came about serendipitously, so I’m describing it in more detail here in the hope that it might be useful to other founders. After raising DataFox’s seed round in October last year, my co-founders and I started sending out a monthly investor update. To this day, it’s a plain text email containing KPIs, achievements, challenges, general updates, and requests for help. By the second iteration, we realized we also wanted to keep other people informed — advisors, friends, and supporters — so we truncated the investor update and the “Friends & Family Update” was born. The F&F Update was very similar to its predecessor, but shorter, more focused on product milestones, and sans confidential information. Who do we send it to? Stay top of mind, efficiently: as a founder you get pulled in a lot of different directions. The Advisor Update allows me to consistently deliver real information about our business to many more people than I’d be able to keep posted piece-meal. Solicit explicit help: the email provides a monthly forum to ask for help with one or two key goals. Provide a catalyst for people to offer to help: by resurfacing in a person’s inbox, the email often reminds recipients to engage with you in a way you didn’t expect or couldn’t have asked for. A reminder to celebrate: time flies at a startup; everyone’s working their butts off — the Advisor Update is an email that teammates can enjoy reading and also forward to their close networks. What goes into the email? Highlights: people are busy, cover your main accomplishments in the first few lines. Call-to-action #1: if recipients could help you with one thing, what would it be? Ask early in the email. 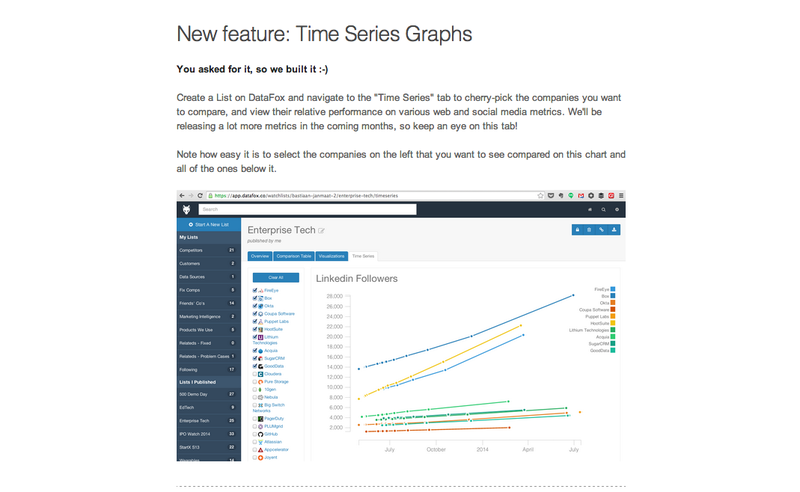 New feature: celebrate product milestones and achievements. Many recipients will find this to be the most interesting section. What have you built, and where can they check it out? Customer love, press: be sure to keep a note of customer compliments and press mentions over the course of the month. Then cherry-pick a few and include them here for reference. Blog posts: if you don’t have a content strategy, it’s time to build one! You can link to some of your most popular posts here. Again, these folks are very busy, so they’re probably interested in your content but would much rather check it out once a month, rather than try following your posts in real-time. Call-to-action #2: help is a two-way street. We were once told, “ask not what your advisors can do for you, but what you can do for your advisors for you.” Often by helping your potential recruits, partners, investors, and clients with something they need, you’re putting them in a better position to help your business succeed in the long-run. I met John eight months before he left LinkedIn to join DataFox. The Advisor Update was a great way to keep him informed about our progress and growth. Two advisors, Mike and Chris, replied to Advisor Update emails offering to make introductions to very high value potential clients. International expansion isn’t something we’re thinking about yet, but when the time comes, it’ll give us a major head-start to know that Alex and Hansjoerg will be ready to help. It’ll probably take you 2-3 hours on a Sunday afternoon to put together your first update. You can track your list of recipients in a simple spreadsheet, paste their email addresses into the Bcc field of an email, and write a plain text summary of the past month’s accomplishments. In addition to acting as a great catalyst for new opportunities to come your way, this email will also become a forcing function — you’ll want to make sure that, at the end of each month, you can report on material accomplishments. Thanks for reading, I hope this is helpful. If you’re interested in receiving more of our blog content, please sign up here. And if you have any other ideas or suggestions, please leave a comment.